How's summer going, reader dudes?? This is a great time of year. A chance to relax and have fun. 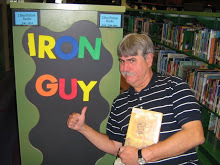 Here you see the Iron Guy chilling at a favorite spot. Of course, he must still work out to maintain his MANLY physique. N.E. R. D. S. by Michael Buckley--Secret agents, flying school buses, world-destroying villains, laughs and action--what more could you want? I must confess that I've read only the first one but other guys have read and recommended them. How to Eat Fried Worms by Thomas Rockwell--Could you eat 15 worms? "Yeecchh!!" you say. Would you do it for $50.00? That's the idea behind this terrific book. It's been making guys laugh for almost 40 years and will make YOU laugh too. The Island trilogy by Gordon Korman--a great survival story with thrills, thrills, thrills. Several troubled kids go on a boat for an extended rehab trip but end up stranded on a deserted island. This island isn't on any map--and for good reason! A really terrific read! 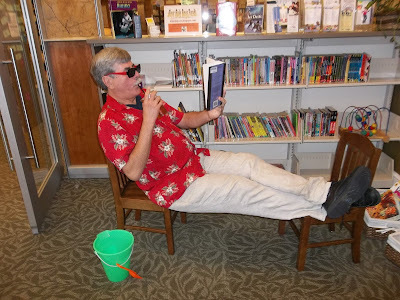 The Adventurrous Deed of Deadwood Jones by Helen Hemphill--Yeehaa! Adventure in the Old West! Two brothers skeedaddle to Texas after the Civil War when some racists threaten them. They join a cattle drive and look for their father. Great fun but serious and sad parts, so you get get a little substance with your fun. Don't let that scare you off, though--still very fun and very highly recommended. The Bone Graphic novels by Jeff Smith--What can I say about this epic graphic novel fantasy series that hundreds of others haven't already said? Probably the best fantasy series ever put into graphic form. Go get it NOW!! The Tiger's Apprentice trilogy by Laurence Yep--Based on Chinese mythology, this fantasy trilogy starts in San Francisco but takes you through far-flung magical lands and into dangers with wild creatures. A great read! 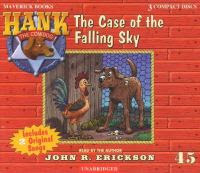 The Hank the Cowdog audiobooks--Going on a car trip this summer? Then take along these very funny audiobooks. John R. Erickson wrote and narrated these and guys really enjoy them. I've seen kids beg for these in carpools! OK, guys, enjoy your summer! 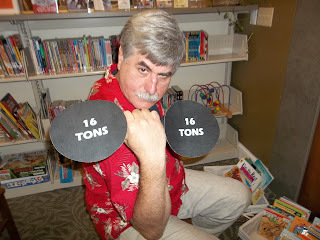 Keep reading and, if you want to find out what the Iron Guy and other people have said about these books, click on the tabs under this post. And if you want to add your $.02, send us a review! All the instructions are on the left-hand side of this page.